Dangerous Animal on the Loose! Dr. Van Goofinshmerk, has dangerously meddled with nature and created a Bat Dile! (bilby cross cockatiel cross crocodile) This creature escaped from his lab at midnight last night (Sunday), after being turned super-sized by its creator. Ever since the breakout, this animal has been rampaging through the streets of Bulimba, and smashing everything in sight with its powerful, spiked tail. Fortunately, it's a vegetarian, so it will not eat humans, but it might squash people with its tail, or slash people with its claws. This animal has been found to like stepping on primary schools, and is currently heading for Sts Peter & Paul's school! So lock your doors! 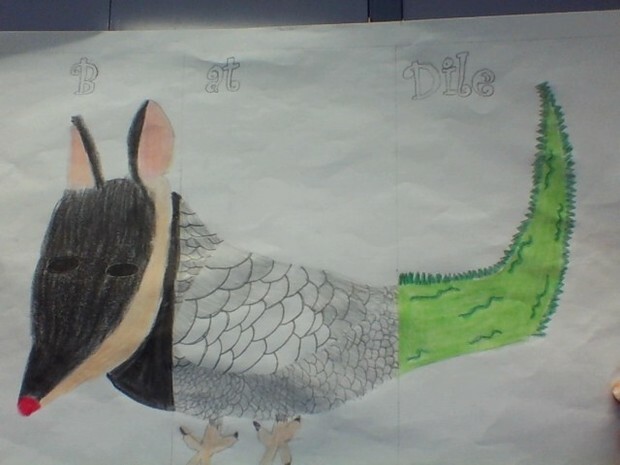 The Bat Dile has large ears, which gives the creature an excellent sense of hearing. Because its blood flows quickly to the thin tissue around its ears, the creature's large ears also prevent it from getting too hot during the day, and losing body heat quickly at night. The Bat Dile's long snout gives it an strong sense of smell, which helps it catch small prey. The Bat Dile has amazing feathers, which are designed to help this abnormal creature fly. They also allow it to fly silently. The Bat Dile's wings are vital. They allow the animal to fly, and this is important, because they are very fast flyers. The claws of this fascinating creature, are extremely important, because these vital claws are what allows the animal to hold onto branches. This creature's amazing, powerful, spiked tail, assists it with running super-fast. There are reports from eyewitnesses, of this dangerous animal breeding. The baby Bat Diles were last seen, in the warm deserts, north of Australia, at 6:30 pm. They are currently being studied at the Australian Adaption Centre, and some new information has been released about their habitat, but not confirmed. The baby Bat Dile's habitat is in the warm deserts, north of Australia, usually where dry grasses are found, so this animal can feast on these grasses. It likes warm areas, because it can't handle too much cold. It also likes to burrow, to escape the heat. If you see this animal do not approach, and contact us at the information above.